I consider it my duty, as it is my great pleasure, to thank you for the kind and encouraging address delivered to the members of my Battalion of the Irish Volunteers who attended Mass in Mount Argus last Sunday. We were greatly delighted and stimulated by your remarks which were as frank as they were unexpected. May we all live to see the day to which we look confidently forward. 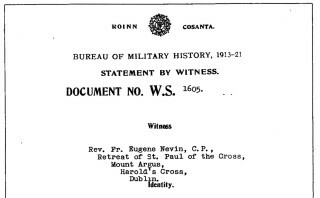 Fr Nevin states: “As a result of my public declaration of view my assistance was eagerly sought to augment the roll call of the Volunteers: but, however much I might wish, I had for the time to demur though I knew from now on I was unofficially regarded as Chaplain to the 4th Battalion under command of Eamon Kent whom I had known for many years…. The situation was an embarrassing one, as the Irish Volunteer leaders were appealing for the clergy’s support so far denied them though freely given to their opposites. 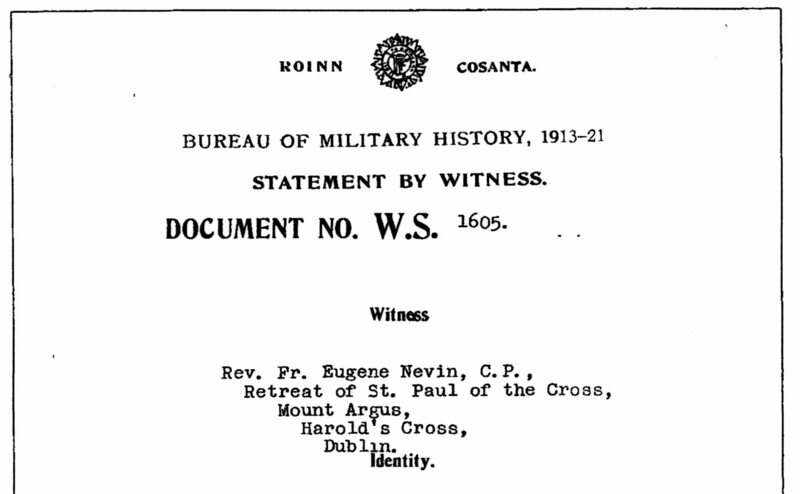 My Provincial Superior – alone of major Superiors – was actively engaged recruiting for the English Army to which I objected and strongly remonstrated with him as bringing the Order into disrepute and branding us as anti-Irish. However as he took no notice and continued campaigning I considered that in fairness he could not object to my taking the other side – nor did he as it is due to his memory to state. A man of many parts, consistent supporter of everything Irish, language, literature, customs and products, he and I were great friends all through until his death in Mount Argus now some years past. May his dear soul rest in peace”. This page was added on 01/04/2016. "I was in Prison and you came to Me"